E2S Warning Signals is featuring the latest product introductions from its extensive range of alarm horn sounders, beacons, loudspeakers and call points for fire and gas warning systems in offshore and onshore hazardous area installations. On Stand 8620 at ADIPEC Abu Dhabi, 12 – 15 November 2018, the booth will feature the D2x family beacons and combi units, UL464 and UL1638/UL1971 approved for public mode fire alarm systems. 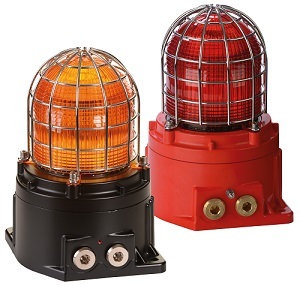 Also featured are the GNEx family corrosion proof GRP sounders, beacons and manual call points with extensive global approvals and the D1x family Xenon strobes, the brightest UL1638/UL1971 approved signals available for Class I/II Div 1 and Class I Zone 1/20 explosion proof applications. The D2x family beacons are available with a high power Cree® LED array and 5 and 10 Joule Xenon strobe beacons that offer exceptionally low inrush and operating currents to optimise cable selection and reduce power supply requirements. The GNEx family is approved by IECEx and ATEX for Zone 1, 2, 21 and 22 use. All the GNEx visual signals utilise a polycarbonate UV stable prismatic lens which is available in Amber, Blue, Clear, Green, Magenta, Red and Yellow and are field-replaceable. The Xenon strobes from the D1x family feature an innovative lightweight, marine grade, corrosion resistant enclosure that can be either conduit or surface mounted as supplied. For complete mounting flexibility an optional stainless-steel bracket enables the light to be positioned in any orientation. With automatic flash synchronization, low inrush and low operating current more units can be installed per circuit, simplifying system design and reducing cost. Darren Mann, International Sales Manager, and Neal Porter, APAC Sales Manager, will man the booth.